Many of you all know that Apple’s ARKit is the biggest change in iOS 11, which is the next-generation iOS platform. Now, the company is planning to transform the entire iPhone into the most advanced Augmented Reality device. The AR revolution will not come with a boom but a tape measure. It seems like a lesson so far from ARKit, which is Apple’s advanced AR platform. 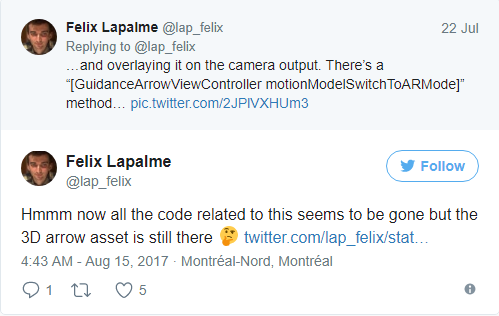 Felix Lapalme has been watching at assets in the Maps app package in order to search whether the company will leverage Augmented Reality for turn-by-turn directions. Last month, he looks around a beta version of iOS 11 and gets to know about this secretive 3D arrow for the Maps application. Now, you might be thinking that Apple will use the arrow for old turn-by-turn directions on top of a map like in traditional navigation applications. However, some of the code will let you tilt your phone in front of your face when you are using walking directions. Along with it, it seems that the Apple’s Maps application will make use of your device’s camera. There is a big chance of this feature, which could be shipped with the iPhone 8. Apple has declared its plans that it will add detailed maps of airports, malls, etc. in iOS 11 so that users can get a guide around their city. The company is planning to ship iPhone and iOS 11 in the upcoming month (September). It wouldn’t be the first time that the Apple’s iPhone will redefine a medium by making a more modest option. Apple had already redefined the videogame industry that was conquered by exclusive and complex console game until the iPhone announced the concept of low-stakes casual games like Candy Crush Saga. Now, the company again will revolutionize the industry using Augmented Reality and give users more power in their devices. Even various augmented reality app development companies have started developing AR apps, comprising advanced features. This entry was posted in News & Events and tagged Apple ARKit, AR app development, Augmented Reality, iOS 11 on August 17, 2017 by Rakesh Patel. Copyright © 2016 Rakesh Patel. All Rights Reserved.